Searching for images is one of the most common searches on the Internet. It is worth using more advanced search engines for images in order to find pictures of a certain size or colour, or when trying to find an image that can be used for a specific purpose. With some image search engines, it is possible to specify which Creative Commons licence is being used for the image being sought. One can also check where a particular image can be found on the Internet using an inverse image search engine. 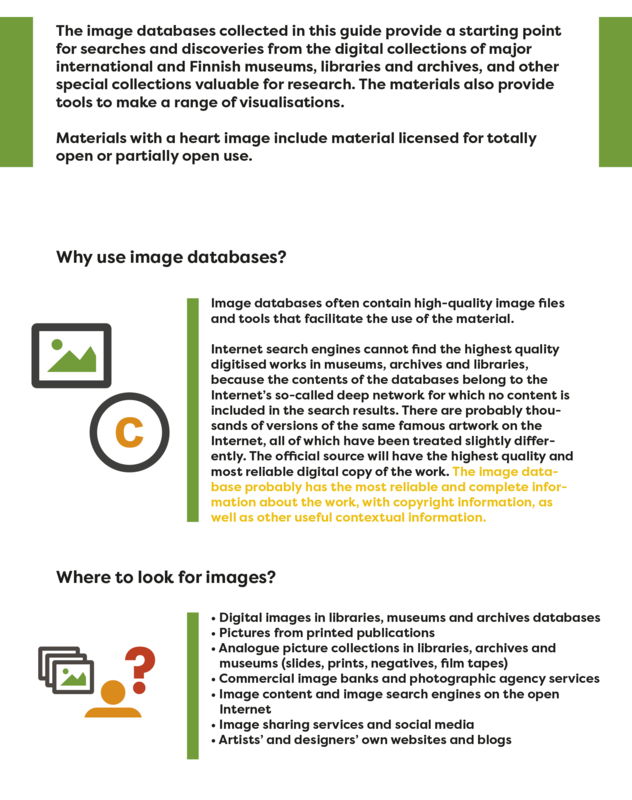 However, it should be remembered that the best image content on the Internet, particularly in the fields of art and culture, is not found in image search engines, as these are often the content of different image databases and web services that the image search engine cannot find. Therefore, it is a good idea to try the different services that are referred to in this guide (see image databases). Open cultural heritage means cultural content or data available in digital format free of charge which is freely available to use, share and edit. Cultural content can be digital reproductions of original works, such as works of art, photographs or documents. Museums, archives and libraries digitise their collections and increasingly make them available to the public in high quality digital versions through various online services and databases. These materials are usually published under an open licence, such as a Creative Commons licence, or their copyright has lapsed. When materials are reusable without technical or regulatory constraints, they allow creative combination and innovative editing. Audiences are also invited to enrich materials, for example, to increase the context information of archive material, or to share new content or interpretations of the material. VRC holds also the DVD-collection of Aalto University Learning Centre. It includes educational programs, artist portraits, documentaries and short films covering disciplines studied at Aalto University School of Arts, Design and Architecture. DVD-collection can be searched in Finna-portal. The DVDs can be borrowed for private viewing for two weeks period. Loans can be renewed twice. Do you know this image database? Europeana brings together European culture, pictures, objects, texts, sounds and moving images over a 2000-year period from a variety of archives, museums, libraries and audio-visual collections. Europeana Launch Video from Europeana on Vimeo.